Who was the mother of Samuel? Attention is again focusing on the one of the world's most vital seaways. Here is the real meaning of the crisis and the background behind the recent United Nations Security Council meeting in Panama. Americans are waking up to a new international crisis, one that is a lot closer to home than Vietnam. The major trading nations of the world are also deeply involved in the issue. 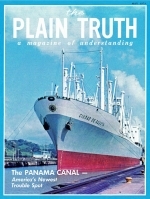 At stake is their continued access, at reasonable cost, to the strategic Panama Canal - the "funnel for world commerce."